Heidelberg, Germany − Heidelberg Engineering will present the latest features of the SPECTRALIS OCT Angiography Module to the international experts attending the 5th International Congress on OCT Angiography in Rome, Italy, December 15-16, 2017. The SPECTRALIS® OCT Angiography Module is a non-invasive imaging technology that provides a three-dimensional depiction of retinal vascular flow with versatility in field of view and image resolution. SPECTRALIS offers the ability to combine OCTA with structural OCT, confocal scanning laser imaging, and dye-based angiography in a single device to facilitate comprehensive clinical assessment and efficient patient care. The new features of the SPECTRALIS OCT Angiography Module which will be demonstrated and discussed in Rome include: an improved image quality for the precise visualization of pathology and structures in the deep vascular complex, a refined retinal layer segmentation and a unique projection artifact removal (PAR) tool. 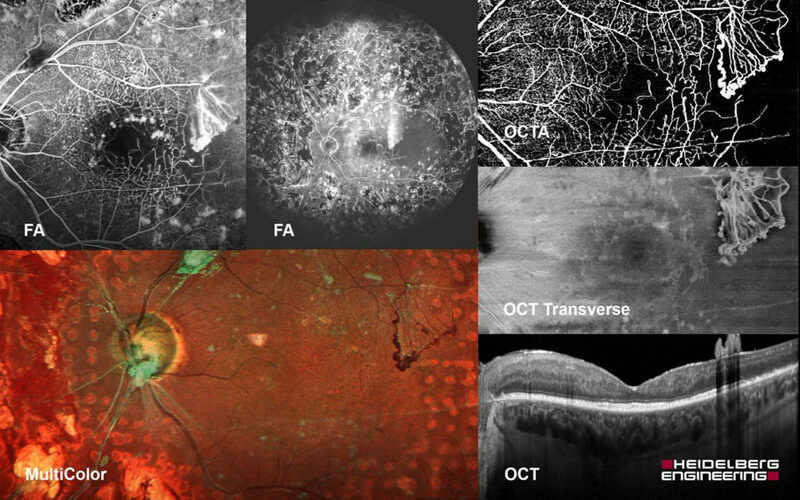 “OCT angiography fully integrated in a multimodal imaging workflow is surely one of the most promising diagnostic tools in modern ophthalmic imaging. However, for clinicians to enjoy its benefits they need a device with resolution that is high enough to see capillary networks in detail and the ability to track eye movement and remove projection artifacts in a reliable manner”, said Dr. Kester Nahen, Managing Director of Heidelberg Engineering. At the OCTA congress in Rome, Heidelberg Engineering’s team will demonstrate how the OCT Angiography Module’s lateral resolution of 5.7 μm/pix and the axial resolution of 3.9 μm/pix combined with its PAR tool allow for a clear depiction of fine capillary networks. The newest version of the OCT Angiography Module provides a continuous set of transverse images co-localized to the anatomic layers of vascular plexuses of the retina as well as to the avascular zone, choriocapillaris and choroid supporting high sensitivity in the visualization of abnormal vessels or vascular voids. A symposium will take place Saturday December 16, 2017 from 12:15 to 13:00 at hall A under the title “OCT Angiography Educational Heidelberg Engineering Course”. The moderator is Prof. Giovanni Staurenghi and several clinicians will present different aspects of multimodal imaging: Matteo Cereda – Widefield OCT; Federico Corvi – Widefield Angiography; Mariano Cozzi – OCT Angiography; Andrea Giani – Macular pigment; Marta Oldani – Multimodal imaging in uveitis and Mariano Cozzi – Multimodal imaging in AMD. Short in-booth sessions entitled “Understanding OCT Angiography” will be held at the Heidelberg Engineering / Eyefocus booth on Friday December 15 at 13:00 and 13:40 and on Saturday December 16 at 10:00 and 15:00. A session with industry leaders named “The future of technology by top industry managers” chaired by James Fujimoto and Bruno Lumbroso will take place on Friday December 15 at approximately 14:30 at the main hall. Dr. Kester Nahen, Managing Director, will speak on behalf of Heidelberg Engineering.